What Kasper calls the “theory of substitution” is the New Testament’s teaching that the old covenant between God and the Jewish people was broken by the crime of Deicide and the apostasy of the synagogue. The Gentiles were called and replaced the Jews, forming a new covenant with God, which St. Paul called the law of grace that took the place of the law of blood. Kasper, without explaining how these identities are linked, thinks it is enough for the moment to say that they are “intimately related to each other.” He suggests the matter be discussed in further dialogue. It is curious to note the spin that Kasper gives to the principles defended in Dominus Jesus. In the document Ratzinger maintained that there would be a “Church of Christ” different from and larger than the Catholic Church. The members of that “church,” which would include Protestants and Schismatics, would normally be able to achieve eternal salvation. Since the Jews deny and hate Christ, how can they find happiness in the same "heaven" with Catholics? 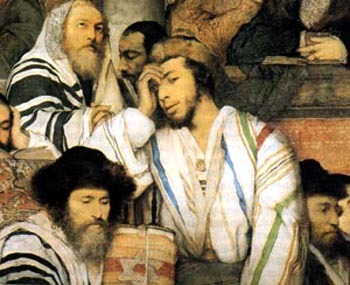 Above, Jews in a synagogue in Krakow. Now, we have Kasper’s interpretation of the same document that goes even further. The President of the Pontifical Council for the Unity of Christians claims that it says that even the Jewish religion would be able to open the doors of Heaven to its followers. My reader knows that Kasper is purposely forgetting a “small detail,” i.e., that this assertion is absolutely opposed to all the Catholic teaching prior to Vatican II. But, for a moment, let me follow along with Kasper’s dream that the religious Jews and rabbis who adhere to that false religion would be saved. What would they find in Heaven? The first person they would meet there would be Our Lord Jesus Christ, Who taught us that He would be our reward exceedingly great. Now then, this same Jesus Christ Whom the Jewish religion so vehemently denies, hates, and would crucify again if He were among us would stand before the “saved” Jews to share with them His eternal happiness. Would this be the paradise they desire? I doubt it.